Wilson Center/Africa Up Close, and Le Matin (January 16 and February 4, 2014) — Four African nations will participate in the winter Olympic games in Sochi, Russia, from February 7-23. Among them, the “usual” Moroccan and Algerian teams will compete, but there will also be a team from Togo and a skier from Zimbabwe. Although more accustomed to summer Olympic sports, Africans have not been as absent as could have been expected in the winter games. Since 1984, with the participation of the Senegalese skier Lamine Guèye in the winter games of Sarajevo, no winter games have passed without athletic representation from the continent. For the Sochi Olympics, which will take place from February 7th to the 23rd, four African countries will be represented: Morocco, Algeria, Togo, and Zimbabwe. The Moroccans and Algerians have already participated in the Olympic games, but this is the first time for both Togo and Zimbabwe. South Africa, Senegal, Ghana, and Ethiopia, present in the Vancouver olympics in 2010, will not take part in the Russian games. In 2012, Morocco’s Adam Lamhamedi won a gold model in the junior Olympics in Innsbruck, Austria, the first African to achieve such an honor. The Moroccans are well-seasoned in the Olympic games, having participated five different times (1968, 1984, 1988, 1992, 2010). In the last Olympics in Vancouver, Morocco only had one representative: the alpine skier Samir Azzimani. In Sochi, the Moroccan team will include three skiers – two males, one female. The first, Adam Lamhamedi, 18, has recently made a name for himself in the world of skiing. Before becoming an adult, this Canadian-Moroccan from Quebec decided to ski for Morocco, the country of his father. In 2012, he caused became a sensation by winning the gold model for the junior Olympics in Innsbruck, Austria, becoming the first African to achieve such an honor. For this first Olympics, Adam Lamhamedi will compete in the slalom and large slalom events. His little brother, Sami, 16 years old, will follow. On the female side, Morocco will be represented by the skier Kenza Tazi. At 17 years old, this Moroccan discovered skiing in the French Alps, where she is currently in a sports high school close to Albertville. 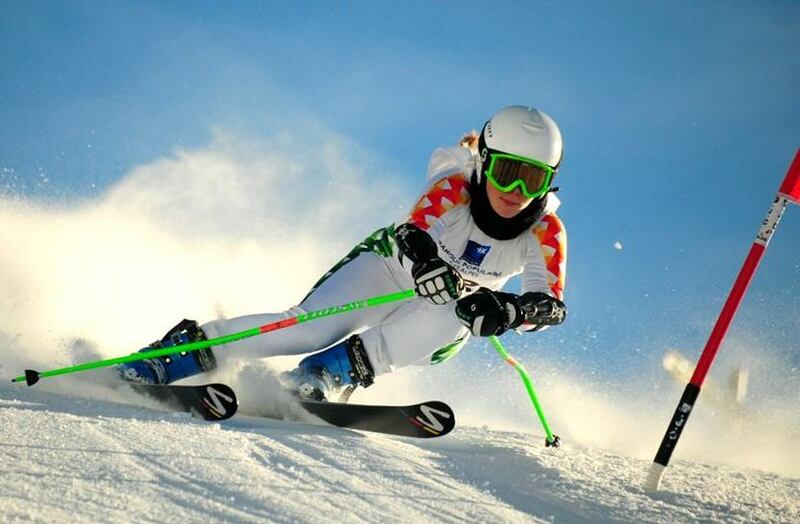 In Russia, she will participate in the slalom and large slalom events. In 2010, at the age of 17, the cross-country skier Mehdi Selim Khelifi was the only Algerian present at the games in Vancouver. At the time that we write these lines, it is difficult to know if the skier, announced to be the only representative of his country at Sochi, will have the new honor of wearing the green and white flag at the opening ceremony. While he has repeatedly achieved the qualifying marks to attend the games, Mehdi Selim Khelifi is still waiting for the call from the Algerian Ski Federation. Time is pressing, as the deadline for commitment is January 19th. Interviewed by El Watan on January 13th, Mehdi Selim Khelifi indicated that he had tried several times to get into contact with the president of the Federation, without success. In Togo’s debut in the winter Olympics, cross-country skier Mathilde Petitjean Amivi, French-Togolese and training in the French Alps, qualified to participate in the 10km classic. She will be accompanied by Alessia Afi Dipol, Italian-Togolese, who will compete in the slalom alpine ski event. A second Togolese cross-country skier, Awa Tomety, still waits to qualify and potentially join her two compatriots in Sochi. Unfortunately, Gervacio Madja, the first Togolese skier to have represented his country in a large international competition (world championships in 2013 in Italy) will not be able to travel to Russia due to injury. Like Togo, Zimbabwe will be represented for the first time in the winter games in Sochi. The only athlete is Luke Steyn, a 20 year-old skier. Born in the capital, Harare, his family moved to Switzerland when he was only two years old. In a statement to a journalist at the New York Times, he said that even though he was young when he left Zimbabwe, he still feels “very attached” to his country. In Sochi, he will defend his national colors in the slalom and large slalom events. This article has been translated from French from the original version on Jeune Afrique. Article translated by Allie Stauss, Staff Intern for the Africa Program at the Wilson Center. Photos courtesy of Morocco on the Move.